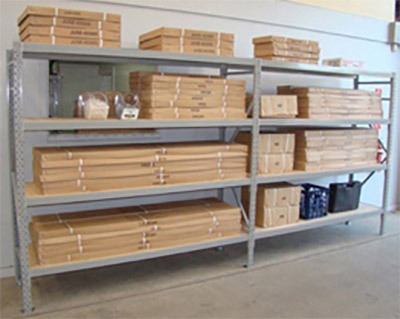 Longspan shelving is our mid-range storage solution. Designed for fitting into squeezy spots and for holding boxes, parts or anything that is reasonably heavy. It still holds impressive weights of up to 815kg per shelf (and 4 tonnes per bay). And we hold so many sizes that we challenge you to find a space we can't fit out to within 20cm. The Quality is Terrific It is really strong, the steel is top quality, the powder coating is superior to competing systems, the base plates are thick. It All Clicks Together The only parts that need putting together are the upright frames. It's a bit of a hassle but we do it for you, so all you need to do is slot the horizontal beams into the uprights and pop in the particle board. It's So Modular We have the biggest range of beam lengths in the country, so we can fit out 99% of space so you can cram the available space with shelves. Need another level of shelves? Easy. Need to add another small length? Easier! Superior Particle Board We use an 18mm thick board which has a water-resistant coating. Reason: 18mm will hold greater loads than competing 16mm systems and if you spill something on it, just wipe the beaded water off with a cloth. Price While our system has superior features, we don't rip you off on price. We don't shove the GST on at the end to surprise you. And if you find a cheaper price on similar quality products we'll beat it. ... then give us a call, we are delighted to help. Choose your specs here! Available Options with pricing will pop up below! Longspan Shelving Complete Bay. A complete Longspan bay with an overall size of 3000mmH x 400mmD x 1320mmW. It includes 2 uprights (3000mm x 400mm), 4 particle board shelves (18mm) and 8 beams (1200mm). It has a 793kg capacity per shelf. Longspan Shelving Complete Bay. A complete Longspan bay with an overall size of 3000mmH x 400mmD x 1620mmW. It includes 2 uprights (3000mm x 400mm), 4 particle board shelves (18mm) and 8 beams (1500mm). It has a 635kg capacity per shelf. Longspan Shelving Complete Bay. A complete Longspan bay with an overall size of 3000mmH x 400mmD x 1920mmW. It includes 2 uprights (3000mm x 400mm), 4 particle board shelves (18mm) and 8 beams (1800mm). It has a 529kg capacity per shelf. Longspan Shelving Complete Bay. A complete Longspan bay with an overall size of 3000mmH x 400mmD x 2120mmW. It includes 2 uprights (3000mm x 400mm), 4 particle board shelves (18mm) and 8 beams (2000mm). It has a 471kg capacity per shelf. Longspan Shelving Complete Bay. A complete Longspan bay with an overall size of 3000mmH x 400mmD x 2520mmW. It includes 2 uprights (3000mm x 400mm), 4 particle board shelves (18mm) and 8 beams (2400mm). It has a 327kg capacity per shelf. 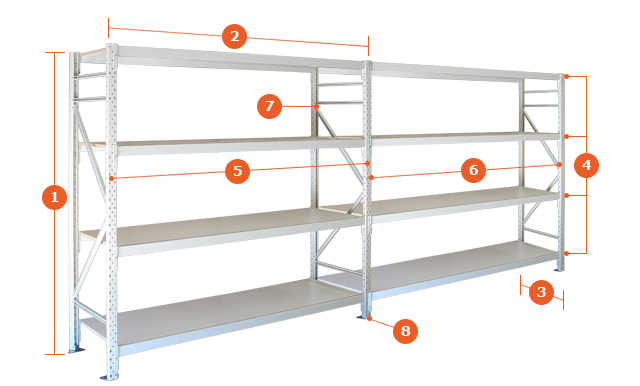 Longspan Shelving Add-On Bay. An add-on bay includes a single upright (3000mm x 400mm), 4 particle board shelves(18mm) and 8 beams (1200mm). This add-on bay will fit a complete bay 400 deep. 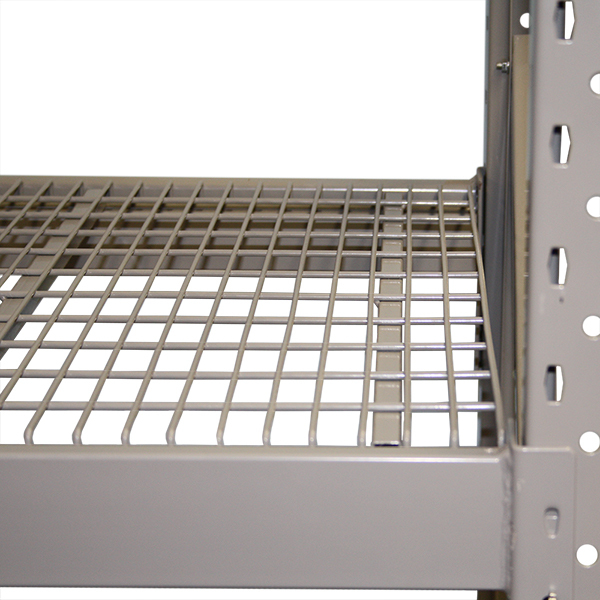 When installed onto your existing complete bay It has a 793kg capacity per shelf. Longspan Shelving Add-On Bay. An add-on bay includes a single upright (3000mm x 400mm), 4 particle board shelves(18mm) and 8 beams (1500mm). This add-on bay will fit a complete bay 400 deep. 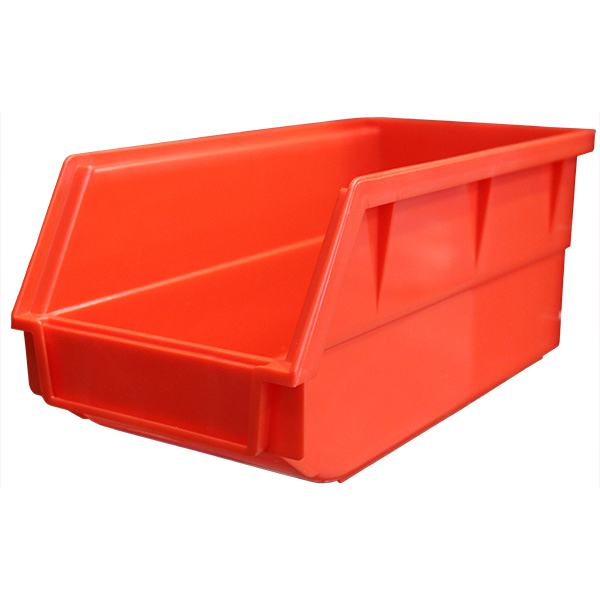 When installed onto your existing complete bay It has a 635kg capacity per shelf. Longspan Shelving Add-On Bay. An add-on bay includes a single upright (3000mm x 400mm), 4 particle board shelves(18mm) and 8 beams (1800mm). This add-on bay will fit a complete bay 400 deep. 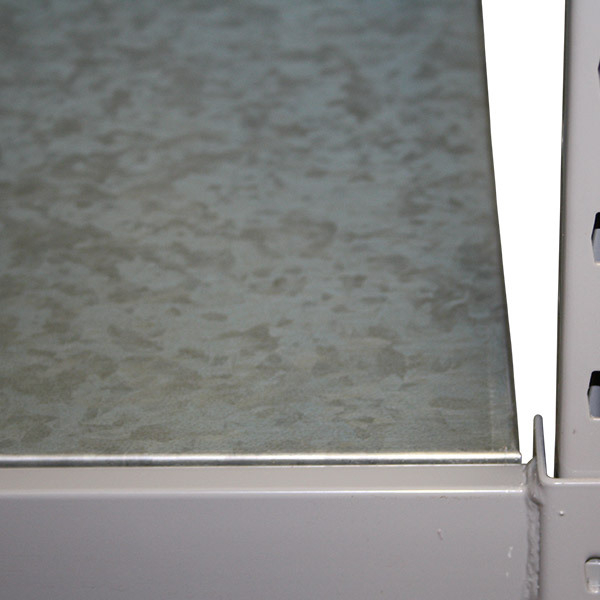 When installed onto your existing complete bay It has a 529kg capacity per shelf. Longspan Shelving Add-On Bay. 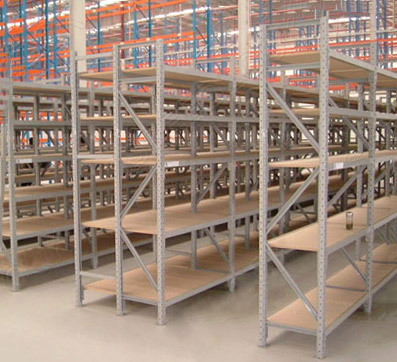 An add-on bay includes a single upright (3000mm x 400mm), 4 particle board shelves(18mm) and 8 beams (2000mm). This add-on bay will fit a complete bay 400 deep. 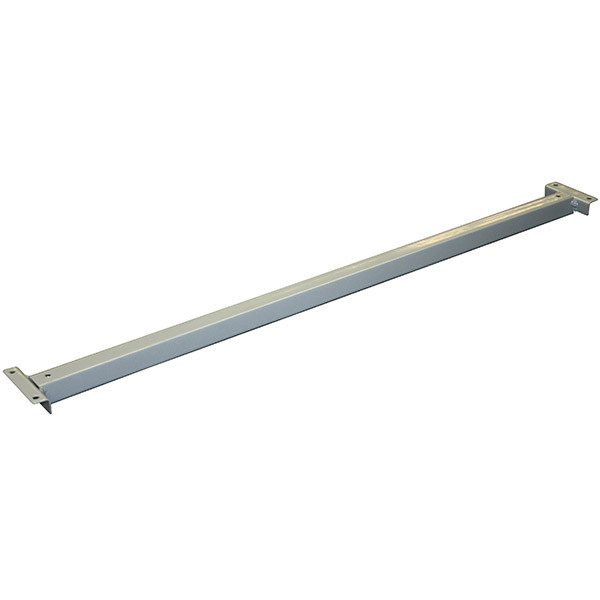 When installed onto your existing complete bay It has a 471kg capacity per shelf. Longspan Shelving Add-On Bay. 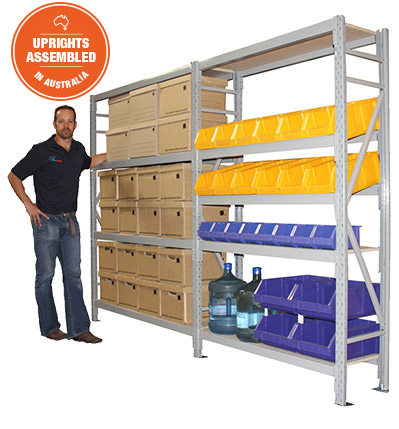 An add-on bay includes a single upright (3000mm x 400mm), 4 particle board shelves(18mm) and 8 beams (2400mm). This add-on bay will fit a complete bay 400 deep. 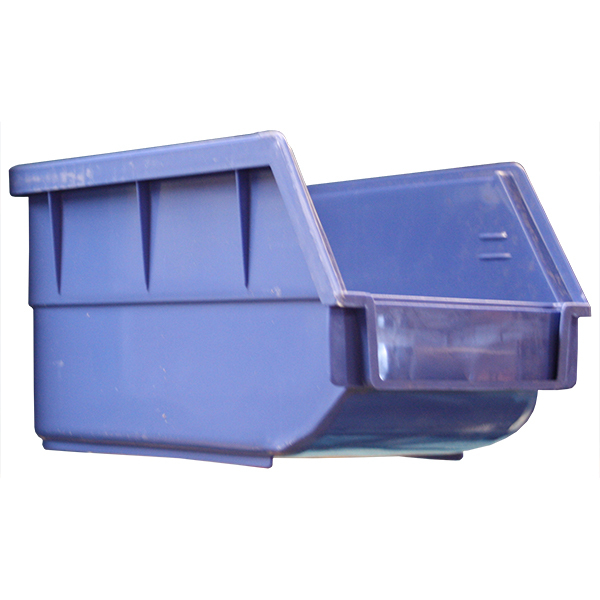 When installed onto your existing complete bay It has a 327kg capacity per shelf. Longspan Shelving Complete Bay. A complete Longspan bay with an overall size of 3000mmH x 600mmD x 1020mmW. It includes 2 uprights (3000mm x 600mm), 4 particle board shelves (18mm) and 8 beams (900mm). It has a 815kg capacity per shelf. Make Longspan shelf mobile with a set of shelves. 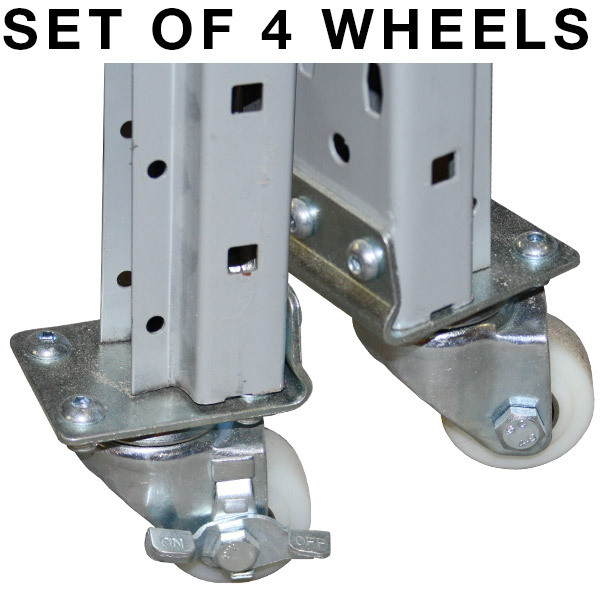 2 locking and 2 non-locking wheels are included. Beam safety pins. Sold each. How High? Uprights come 3 heights 2000, 2500 or 3000 mm. How Long? Choose the lengths of your beams. 900, 1200, 1500, 1800, 2000, or 2400 mm. How Deep? 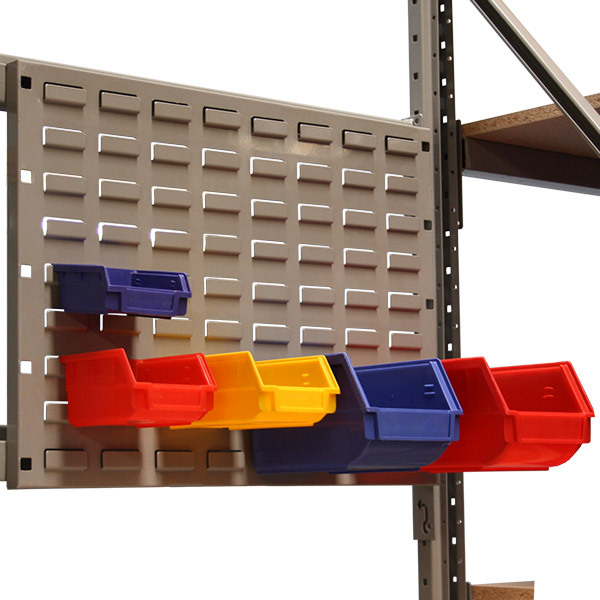 Your bay depth is determined by what you need to put on your shelves. 400, 600 or 800 mm. How Many Shelves? 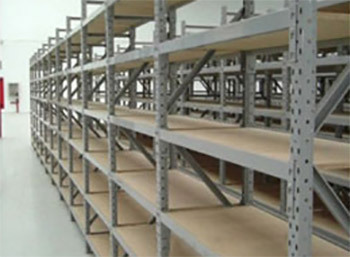 4 shelves are supplied as standard. Let us know if you need more! First Bay Every run needs a first bay which includes 2 uprights to get started. Add-on Bay Continue your run by connecting add-on bays. Each add-on bay is supplied with a single upright. 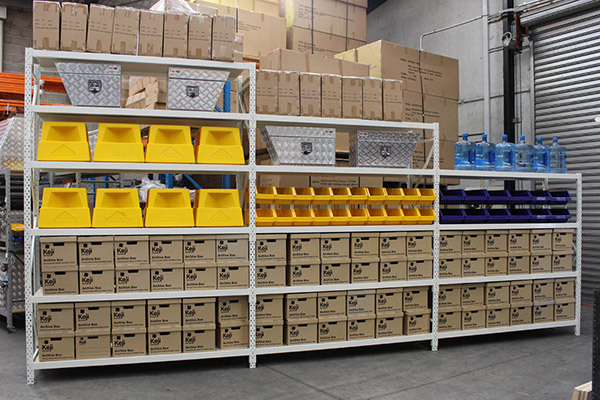 Load Capacity Our bays can hold up to 815kg per shelf and 4000kg per bay. Base Plates Strong inward facing base plates allow you to bolt your shelving down for extra stability. 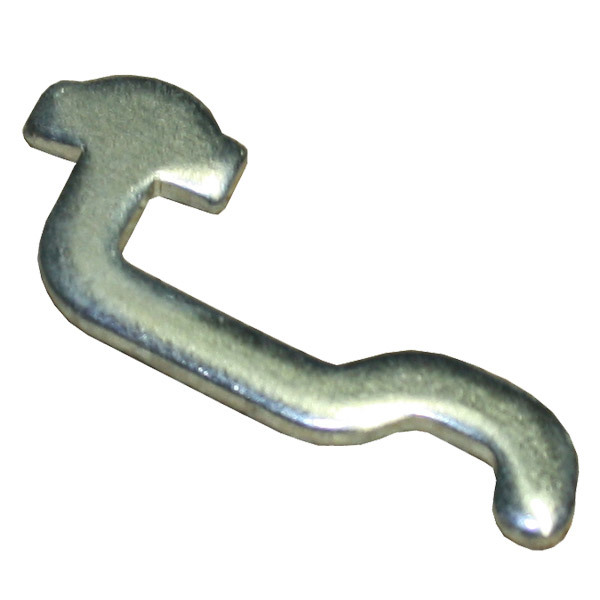 Available in white or grey - perfect for your showroom or your wharehouse. You have 4200 mm of space and your staff can reach up to 2000 mm high without getting dizzy. 600mm deep is good fit with what you want to store. And 4 Shelves is fine. So you'll need more than 1 bay. Get 1 "First Bay" of 2020-6 and an "Extra Bay" of the same. Total width = 55 + 2000 + 55 + 2000 + 55 = 4165mm. Confused? 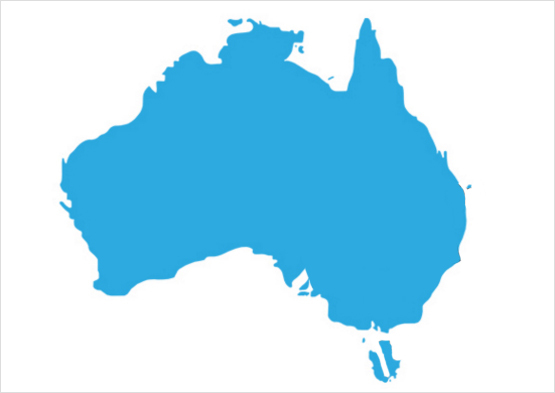 Give us a call on 1300 864 725.